While scanning an article in the July / August 1966 edition of American Modeler, I ran across this page titled, "A Statement of Policy." It talks about this issue being the first published by the magazine's new owner, Potomac Aviation Publications, and how beginning in January 1967, the magazine will be published monthly rather than in a bi-monthly manner. This, the July-August issue of AMERICAN MODELER, is the first published by the magazine's new owner, Potomac Aviation Publications, Inc., of Washington, D.C. With this issue, one of the world's oldest and most famous hobby magazines, inaugurates a new policy stressing model aviation. This policy will be fully implemented by mid·1967. Special attention will be given the younger modeler, and the beginner. After the September-October and November-December issues, the AMERICAN MODELER goes monthly in 1967. Like the New Year itself, it will look, and be, quite different by January First of next year. Cornerstone of this new policy is the model airplane enthusiast. And the role of model airplane building and flying in this air-space age. Rocketry is part of the picture. Too long has our press apologized for an imagined lack of mission in maintaining our obvious place in the advancement and support of aeronautics-for opportunity, career and enjoyment. Too long have we wrung our hands for the "lost" beginner, whom we have discouraged by a lack of service and assistance, and a determination to convert the activity into a sport for affluent adults only. Although the specific details, must be self-revealing, the broad outlines were roughed out in the previous owner's (Conde Nast, of New York) announcement in their last issue. "While AMERICAN MODELER readers will continue to receive the finest features, plans, and articles-to which they have long been accustomed ­ special youth-in-aviation material will translate into action the hobby pub­lishing field's concern that young people should enjoy a hobby-sport that develops skills and interests leading to careers in many major fields ­ notably aviation and space." To exist, any hobby must bring reo wards. Pleasure. Creative fulfillment. Action, and even thrills, perhaps. Model airplane building brings greater skills and knowledge to its practitioners, and for those young enough, is a stepping-off place to the professions, again aviation and space. For two generations, these attributes made the model airplane activity self-promoting -air schools and military services stated that 90 percent of their pilots had been modelers. Even the astronauts include ex-model­ers-as the interview with Frank Borman (see page 42) attests. Examining the guest books at Phil Corr's hobby shop in Washington, we were struck by the hundreds of signatures of well-known people from all walks of life, from many lands which reflect the con­tinued interest in air modeling by so many who remember it from younger days. The model airplane hobby cannot exist on a broad basis without the magazines playing a vital part in bringing up new participants. Here, A.M. parts company with any contemporary who believes that A,B,C,'s have no place in its printed pages. If they join us in this important mission, we welcome them aboard! Last, but not least, there is the place of the Academy of Model Aeronautics in this expanding picture. 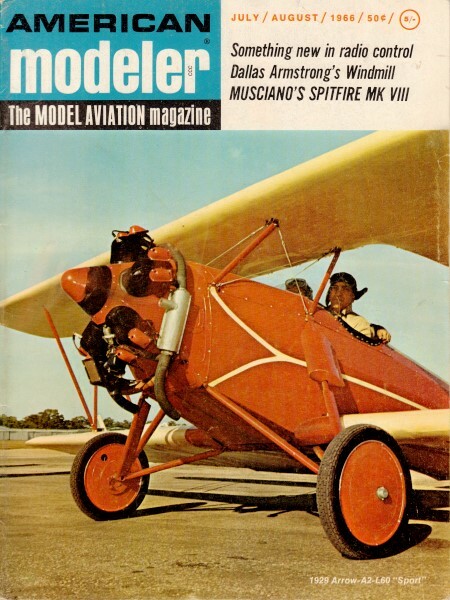 AMA begins, with this issue of A.M., a special section (see page- 41), replacing their of­ficial magazine, MODEL AVIATION, which suspended publication with its June 1966 issue. All AMA members will receive AMERICAN MODELER as part of their membership package. This exposure of AMA to the much greater modeling audience is expected to expand that organization's member­ship beyond its current, height-of-the­season peak of about 17,000 people. It is to be noted that the AMERICAN MODELER is not exploiting in any man­ner the presence of this AMA section. You, too, can participate in this pro­motion of the model airplane hobby. Let others see you fly. Talk to them. Every reader is an ambassador of good will. And join us here next issue!